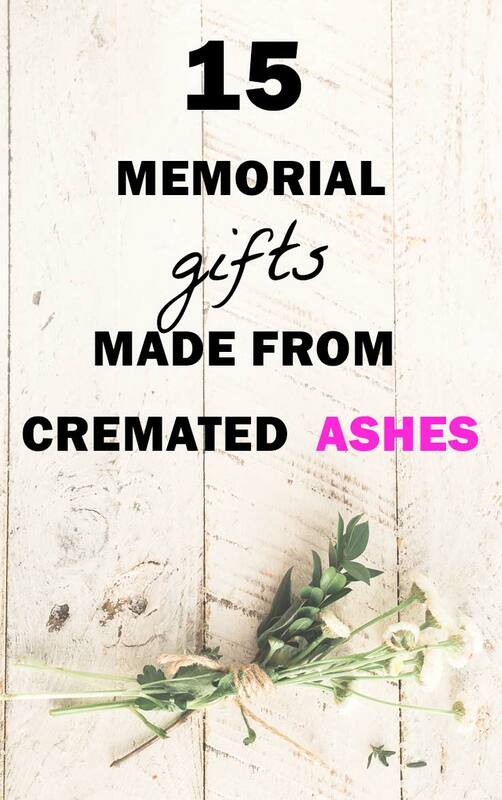 A memorial made from cremated ashes is simply the ultimate way to keep your loved one close to your heart. Here are 15 creative and unique memorial ideas made using actual cremated remains. 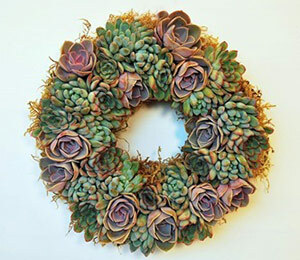 These include decorative accents, jewelry, and even trees. Please note that this article contains affiliate links. This means that, if you were to purchase something through one of our links, we might get a small commission at no cost to you. This is how we keep our recources free to you! 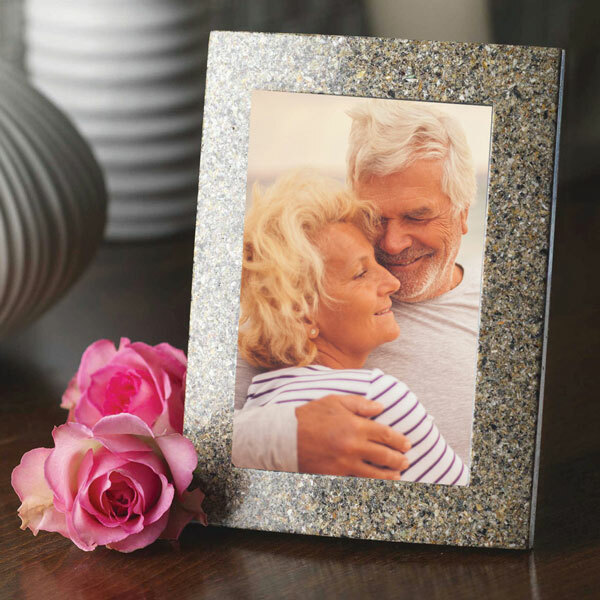 This lovely little picture frame has a sophisticated “granite” look with a smooth, medium-gloss finish. 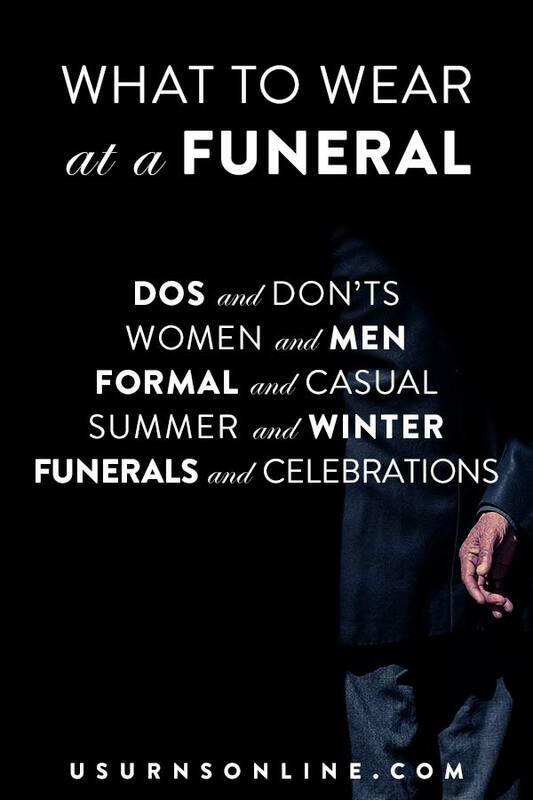 But don’t be fooled – those are actual cremated remains that you see there. Send in your loved one’s ashes and you will recieve a truly “one of a kind” 3×5 or 4×6 photo frame to honor your loved one in a special way. 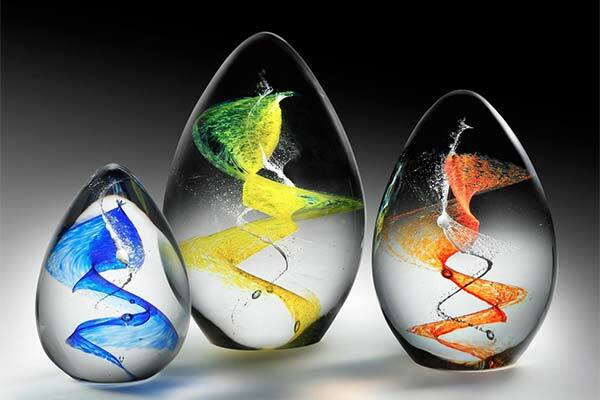 These unique glass sculptures are made out of your loved one’s cremated ashes. Each one is hand crafted individually using a small portion of the remains. 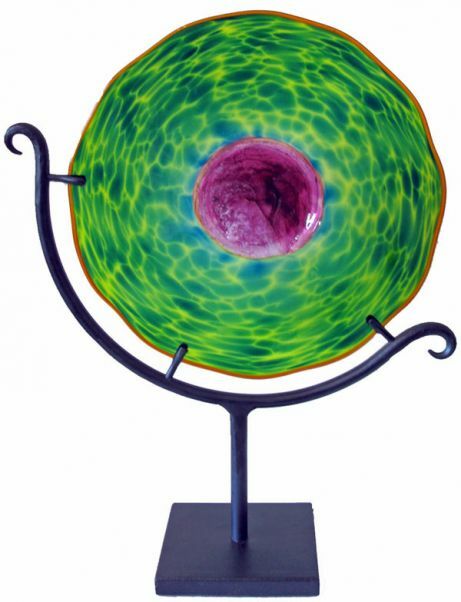 Optional base stands feature LED lights that provide a luminescent glow to the glass art piece. Available from Crystal Remembrance. You can have your loved one’s remains infused into a variety of glass items. 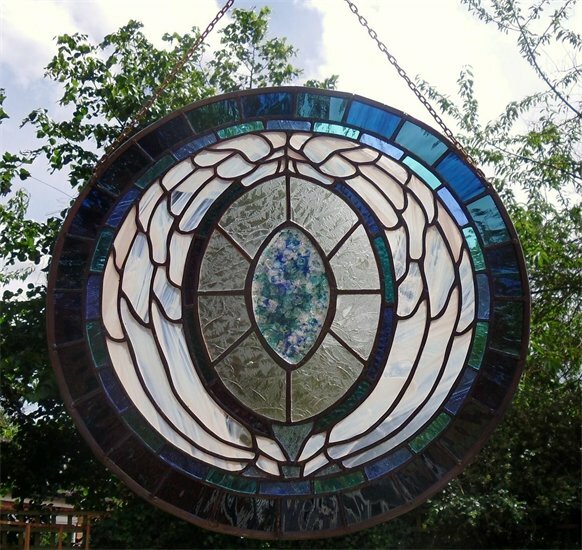 From Forever Close Memorials, here is a stained glass window crafted using ash-infused glass. They also make a wide variety of pendants, mementos, and jewelry items. 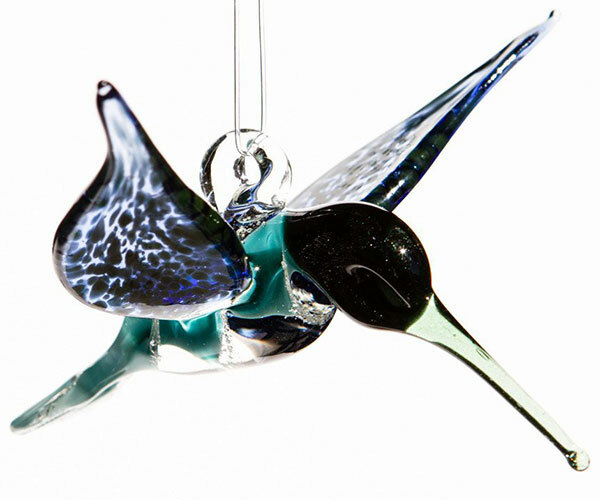 This beautiful handcrafted hummingbird figurine is made from glass infused with cremated remains. 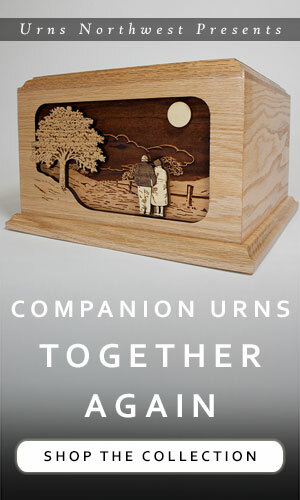 Available from Spirit Pieces, a collective of artists who craft an extensive selection of memorials using your loved one’s ashes. 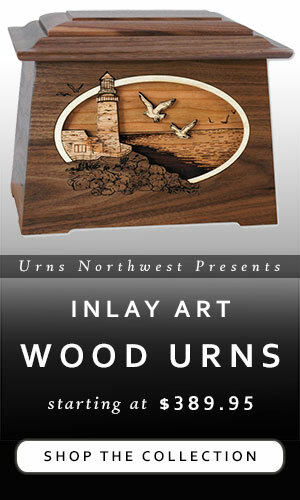 Their non-ash-infused art pieces are available here. 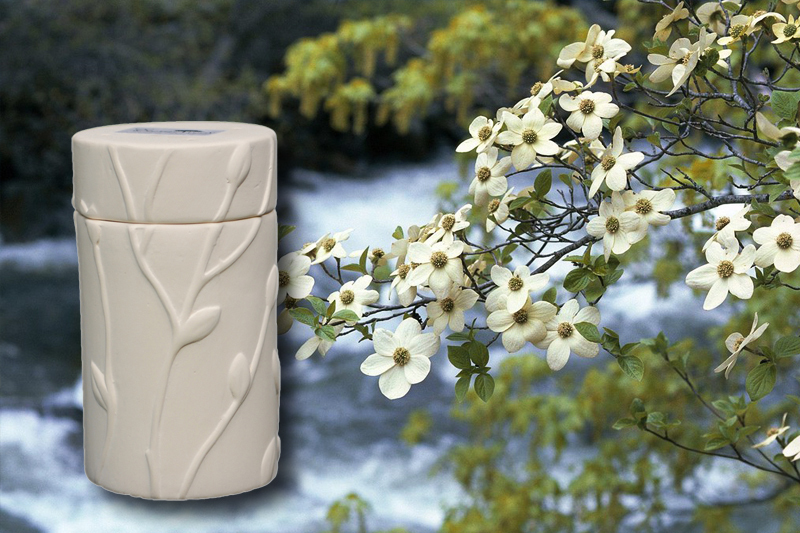 These simple and affordable memorial tree urns allow you to grow a tree from your loved one’s ashes. Each urn holds a portion of the remains and includes a seed from a variety of trees, including the popular Dogwood tree shown above, Blue Spruce, Flowering Cherry, and more. You can also get the Personal Choice which allows you to place your own seeds into the urn. All you do is fill the urn with remains, plant as you would normally plant a seed, and watch a “living memorial” grow. Available here. 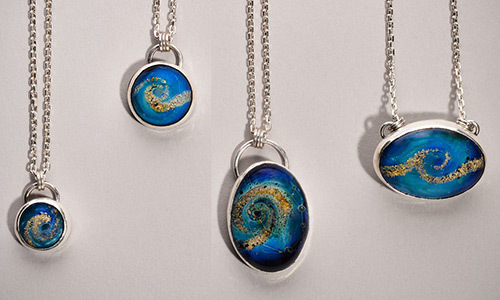 In addition to the more “standard” cremation jewelry that has a small space for you to insert your loved one’s remains, you can also get jewelry custom-made for you that actually incorporates the ashes into the jewelry itself. In the Round Memorial Necklace in Sterling Silver pictured above, you can see the remains cast into the pendant, which can be done in your choice of red, yellow, green, blue, or clear finish. There are plenty of shapes and styles for these necklaces, including dolphins, butterflies, and hearts, plus rings and a variety of different pendant styles. See more here. There are two types of cremation jewelry beads: those that hold cremated ashes, and those made from cremated ashes. As an example of the beads that will hold remains, check out these “pandora” style cremation beads, each of which will hold a small amount of ash. You don’t need to send anything off to an artist, just fill the beads and you’ll have a beautiful memorial necklace ready to go. However, if you are looking for memorial beads that have the remains actually made into the product, here are some options for you. 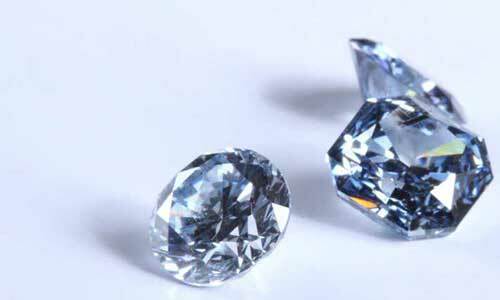 Heart in Diamond produces a truly valuable diamond – one made using your loved one’s cremated ashes. Available in a variety of sizes, cuts, colors, and settings, this is the ultimate memorial keepsake. 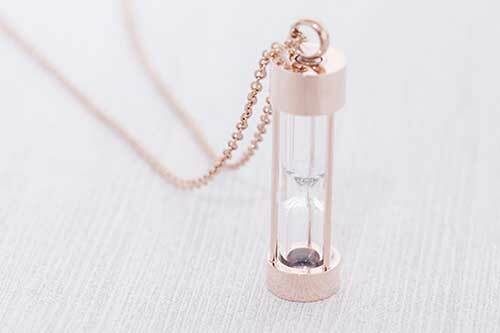 This adorable Hourglass Cremation Urn Necklace in Rose Gold Finish is a lovely little memorial, an attractive stainless steel hourglass pendant that keeps your loved one’s remains visible and near. It’s affordable and versatile, so you can get one for any family member that wants one. 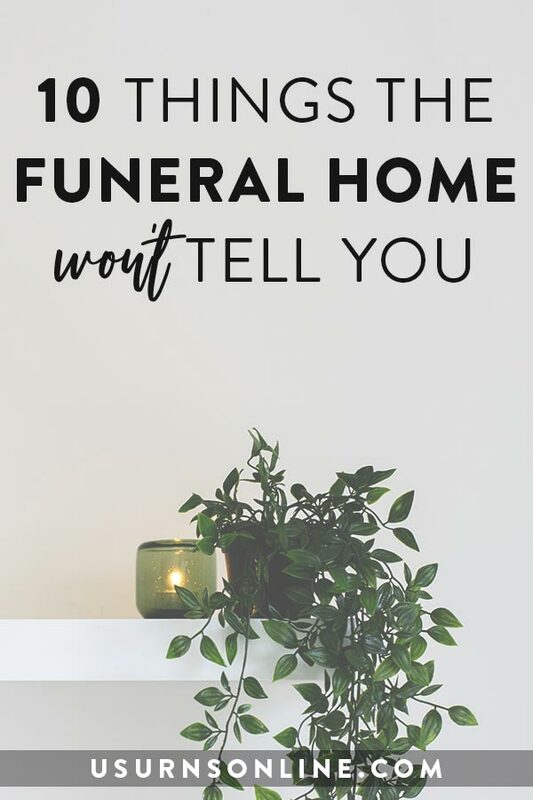 There are also full-size cremation urn hourglasses available, which provide a truly unique way to keep and showcase your loved one’s remains. Icons in Ash is one of several creative artists who work in the most unusual – yet precious – medium: human ashes. Lifelike black & white portraits are hand-painted using the cremated remains of your loved one. This is a beautiful idea that you can take in any number of directions. For instance, Marvel Comics author and editor Mark Gruenwald had his ashes mixed in with ink which was then used in a comic book. You can use this ink in a grief journal, an art sketchbook, or for everyday use to weave their memory into your daily life. You can have a special pen engraved in their memory. If you’re into Pinterest/Etsy style typography art, decorate your walls with creative and inspiring quotes drawn with the ink. The possibilities are limitless. 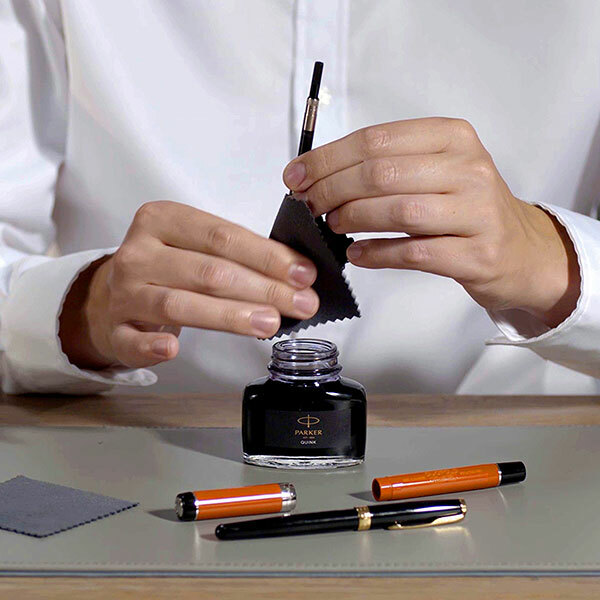 To make ink with cremated ashes, the simplest and best way is to mix the remains with some good-quality writing ink. Sift the ashes so that you have only the finest particles, and mix a small amount in with the ink. Tattoo ink gets its own mention because it is a different process and far more intimate and permanent than general ink usage. 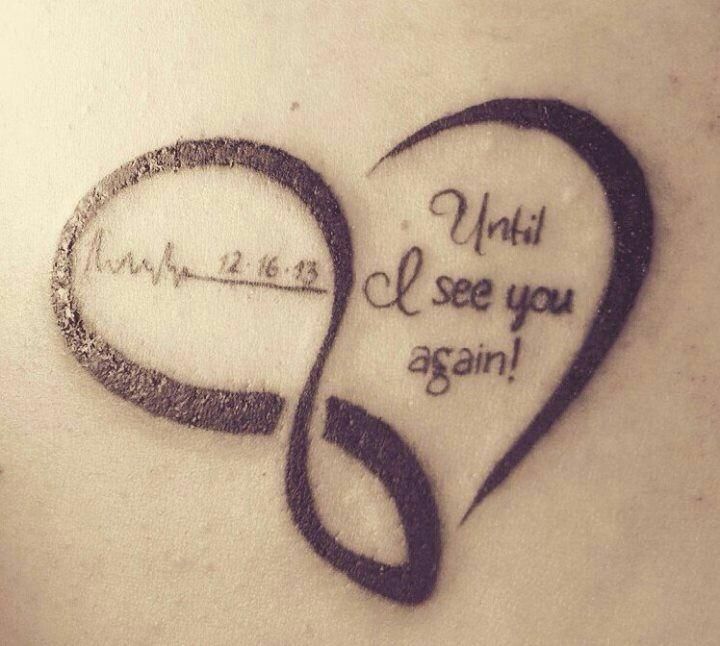 Memorial tattoos are a popular staple of tattoo artistry, and using ink with cremated ashes is becoming more and more common. 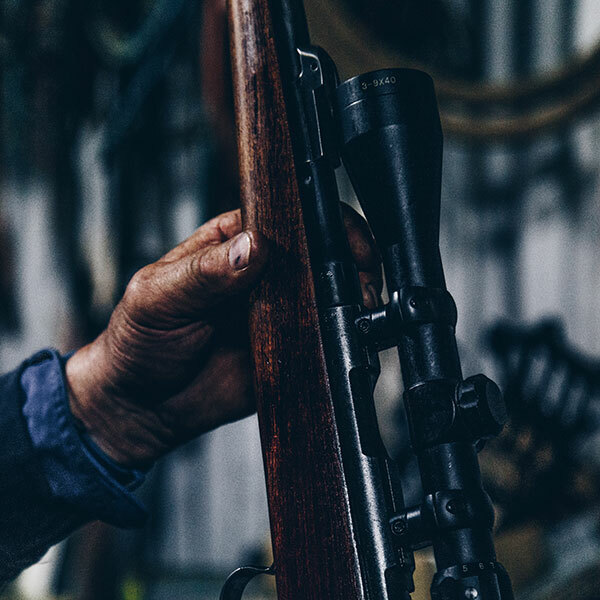 Holy Smoke is a service that will take your loved one’s remains and fill ammunition of just about any caliber so you can celebrate their live and loves in a very special way. Eco-friendly and affordable, this is the perfect way to honor a hunter, gun enthusiast, military service member, or law enforcement office. Here is an elegant art deco piece, the lovely Radiance Suncatcher with Stand. Hand crafted with the loved one’s ashes visible in the center piece, this memorial is truly one-of-a-kind and available in a variety of colors. Eternal Reef is helping rebuild coral reefs by creating cement structures that the coral can latch to and grow on. 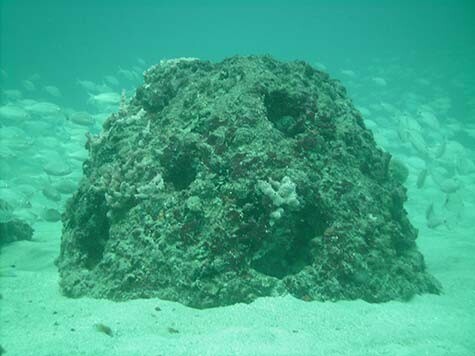 This reef-making process involves placing your loved one’s cremated remains into the cement mix before it is poured into the form which the coral grows on.